Many individuals including those in the medical community are completely unaware that intestinal permeability aka leaky gut, underlying bacterial, fungal, yeast and parasite infections, an altered microbiota, imbalanced flora, and an unhealthy, leaky gut is the root cause of their health problems. During the last 50 years, the average person’s health has been significantly challenged and weakened due to unhealthy food choices, poor food quality, depleted soils, antibiotic overuse, chemical exposure, GMOs, glyphosate, pesticides and herbicides, OTC and prescription drug use, sleep deprivation, chronic stress and altered gut bacteria, which ALL contribute to compromised digestion, increased risk of infection and autoimmune disease. There are any other chronic health complaints and complicated diseases are also linked to leaky gut. 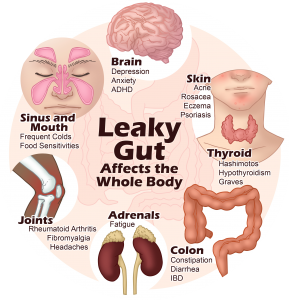 Leaky gut is a modern epidemic and a major cause of dis-ease and dysfunction. The intestinal lining has tight junctions and acts as a barrier to prevent foreign particles from passing into the bloodstream. The health and integrity of this mucosal lining is crucial to immune function, brain function and overall health. Leaky gut is a condition where microscopic holes occur in the lining of the small intestine, which results in undigested food, gluten, bacterial by-products, microbes (fungus, Candida, parasites, viruses), waste and environmental chemicals to weaken the tight junctions and actually “leak” through your digestive tract and enter your body. Over time, these items accumulate and damage the intestinal lining. The immune system views this as a foreign invasion creating antibodies against its own tissues resulting in chronic inflammation, increased cortisol, and opens the door to developing chronic disease. These include diabetes, IBS, IBD, eczema, psoriasis, adrenal insufficiency, chronic fatigue, autism, Alzheimer’s, asthma, depression, anxiety, sinus infections, heart disease and autoimmune disorders. If the resulting antibodies are attracted to the thyroid, we call it Hashimoto’s thyroiditis. If antibodies are attracted to connective tissue, we call it Lupus; to skin tissue, psoriasis; to nerve tissue, MS; to joints, rheumatoid arthritis. The gut is considered the second brain also known as the enteric nervous system that is located in sheaths of tissue lining the esophagus, stomach, small intestine and colon. Many GI disorders like colitis, leaky gut and irritable bowel syndrome originate from problems within the gut’s brain. In fact, most ulcers are caused by a bacterium. Keep in mind that the brain in the gut has a mind of its own that guides our feelings, moods, certain behaviors and reactions, and plays a major role in our happiness and misery. Approximately 90-95% of serotonin made in the gut. When the gut’s inflamed, infected with pathogens, not functioning optimally or the gut is leaky, production of serotonin and other neurotransmitters will be impaired leading to depression, anxiety, mood disorders and neurological manifestations because the gut has lost the ability to effectively absorb nutrients or convert them into these vital brain chemicals. Having leaky gut is linked with heart failure (Sandek et al. 2007). Leaky gut syndrome affects the brain too, and has been linked to psychological disorders such as anxiety, bi-polar and depression. Bear in mind that an inflamed gut or leaky gut equals an inflamed, leaky brain, and an inflamed, leaky brain increases risk of depression and dementia. In a study published in Acta Psychiatrica Scandinavica, approximately 35% of those who were depressed showed signs of leaky gut syndrome. The mechanisms that cause leaky gut are the same that cause leaky brain. 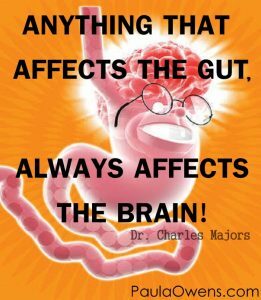 The brain communicates with the gut via the enteric nervous system. The intestinal nervous system is wired back to your brain and cellular communication occurs between the two. When there’s communication problems from the gut to the brain or from the brain to the gut, health is compromised – no question. David Perlmutter, MD, Board-Certified Neurologist and author of Grain Brain says if his patients have brain problems, he always looks to the gut first. He believes no organ is more susceptible to the damaging effects of inflammation than the brain. Although the blood brain barrier protects it to some degree, if you have a leaky gut, you probably have a leaky blood brain barrier, which increases oxidation, chronic inflammation and an overactive immune system (three main killer insults). 1. Gluten is a major cause of leaky gut. Gluten activates zonulin, a protein that opens up the spaces between the cells of the intestinal lining. Gliadin, the protein found in wheat causes zonulin levels to increase, which results in leaky gut and leaky brain. The more zonulin in the blood, the more permeable the tight junctions of the GI lining become. Leaky gut is associated with wheat (Dalla Pellegrina, Rizzi, Mosconi, Zoccatelli, Peruffo, & Chignola, 2005). Other pro-inflammatory foods that are especially problematic and trigger leaky gut include unsprouted grains, sugar, processed foods, genetically modified foods, conventional factory-farmed animal protein and dairy, casein, artificial sweeteners, and any particular food an individual may be sensitive to. 5. Dysbiosis, an altered microbiome and bacterial imbalances. Physical and mental health problems including depression, anxiety, diabetes, autism, Parkinson’s, IBS, Crohn’s, rheumatoid arthritis and many other autoimmune disorders are linked to imbalances and abnormalities of gut bacteria. 1. Remove inflammatory items that irritate and damage the gut, and contribute to leaky gut syndrome. These include gluten, wheat, grains, fructose, sugar, conventional factory-farmed animal protein, artificial sweeteners, dairy, soy, alcohol, pesticides and GMOs, carrageenan, lectins, antibiotics, NSAIDs, food sensitivities, contraceptives, antacids, vegetable oils, chronic stressors and heavy metal body burdens. Permanently avoiding these items as part of a healthier lifestyle works best for gut restoration and long-term health, especially for those with autoimmune disorders. Of primary importance is identifying the root cause so that healing and repair can occur. Rule out Candida, SIBO, fungal, parasite, bacterial and viral infections, H. pylori, heavy metal toxicity, and removing these infections from the body is crucial for the healing process to occur. In my practice, that starts with a Functional Blood Chemistry Analysis and Comprehensive PCR Stool test. The stool test provides an extensive look at the health and function of your gut. It evaluates microbiota, levels of healthy gut flora (bacteria balance & imbalances), detects underlying pathogens and infections, parasites, fungi, Candida, bacterial, maldigestion and malabsorption, inflammation, immune function (sIgA), short chain fatty acid status and other important biomarkers of GI health. 2. Repair. 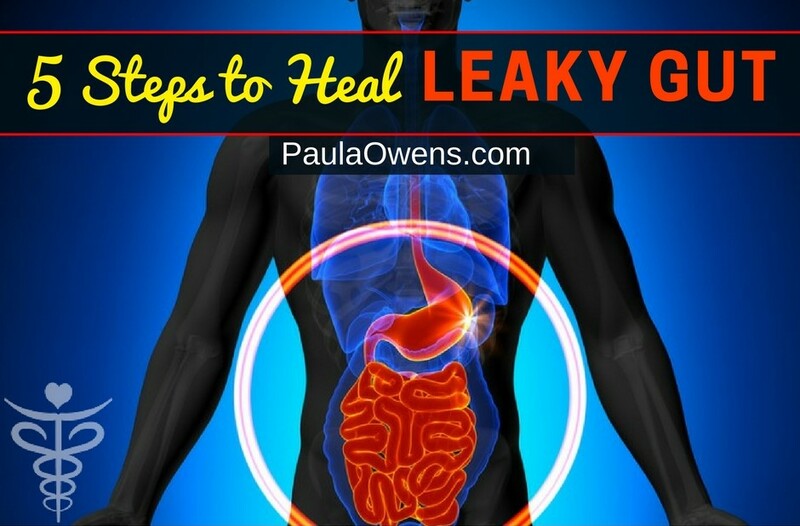 Critical to the success of healing leaky gut is repairing the intestinal mucosa. Omit the irritating and inflammatory factors (see list above under “Remove”). If an infection is identified, the repair process will also include nutrients, herbs and specific supplements to eradicate and eliminate the infection. If an infection is identified, a specific diet, supplement protocol, lifestyle principles and a healing regimen must be followed for a specific length of time. 3. Restore. Choose organic foods as much as possible. This especially applies to all animal protein and the EWG’s “dirty dozen” fruits and veggies. Restore gut function with anti-inflammatory foods including homemade bone broth, coconut products, organic non-starchy veggies, cruciferous veggies and leafy greens, smart fats such as grass-fed butter and coconut oil, grass-fed and pastured-raised meats, fermented veggies, probiotics, and nutrients specific to the individual, which are identified through a Functional Blood Chemistry Analysis. Minimizing stress, managing stress and healing the adrenals is crucial in gut restoration. Some of my favorite ways to lower stress and activate the parasympathetic branch of the nervous system include yoga, dantian Qi gong, breathing exercises, meditation, music therapy, nature walks, biofeedback, spending time with my dog, journaling, setting healthy boundaries, solitude, aromatherapy, or using the Inner Balance™ App, which helps change your reaction to stress, gain insights into your shifting moods, and create a more positive outlook on life. 4. Replace. Eat nutrient-dense real foods and drink clean filtered water. Supplement appropriately with probiotics, hydrochloric acid (HCL), bile support, pancreatic or digestive enzymes. Correct nutrient deficiencies or excesses (unique to each person), which can be identified through a blood chemistry analysis and functional health assessment. Physical and mental health problems including depression, anxiety, diabetes, autism, Parkinson’s, IBS, Crohn’s, rheumatoid arthritis, Hashimoto’s and many other autoimmune disorders are linked to imbalances and abnormalities of gut bacteria, gut pathogens, leaky gut and infections (Candida overgrowth, parasites, yeast, fungi, bacterial, H.pylori, SIBO). Once again, identify the root cause! 5. Revolutionize. Of primary importance, and often neglected in healing leaky gut is addressing the underlying causes, prioritizing a healthy gut as a lifestyle (and, not reverting back to old behaviors, unhealthy diet and lifestyle habits), and managing and minimizing various sources of stress (emotional, physical, mental, lifestyle, spiritual, relational and environmental). Making dietary and lifestyle changes that support a healthier gut must be an ongoing permanent lifestyle change. You can be eating the healthiest, organic foods, moving your body and meditating every day, and taking the best supplements in the world, but if you’re in a miserable, unfulfilling relationship, dread going to work, don’t love what you do, or there’s a mental thought pattern, repressed emotions, or you neglect yourself emotionally true healing, health and happiness will evade you. “Doing your work” to heal, surrender and release old behaviors and deeper components that no longer work is a must for gut restoration, cellular healing, health and happiness. Emotions, old behaviors and past stuff is often an overlooked spoke in the wheel of health, and why a person may be doing everything right, but unable to lose weight, feel their best, reverse a dis-ease, or balance their hormones. Identify the Root Cause: Test to Assess, Don’t Guess! Is Candida Affecting Your Health?